At first, it's not obvious why someone who is interested in high quality photography as I am should want to have a digital camera. Yes, they're fine for estate agents who want a small print, and they want it today, but surely they aren't suitable if you want high quality, or want to work three weeks in the field with no PC to hand. What really drove me was the realisation that I simply was not looking at the slides I was taking. Okay, perhaps I looked at them once, when they came back from Kodak, but these last two or three years the slides had simply been put away and forgotten. I was also finding that carrying camera, flash and lenses was more of a load than I liked. The final part of the picture fell into place when Nikon announced the CoolPix 900 in the middle of 1998. I decided to get one. 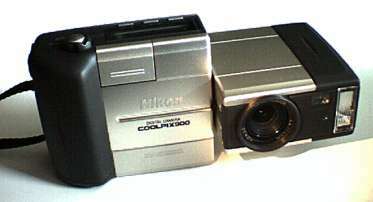 The Nikon CoolPix 900 has a 1280 x 960 CCD sensor, which provides enough resolution to make A5 sized (approx. 5" x 7") prints without the pixels being visible, but there might be slight visibility with an A4 (8" x 10") printout. The camera doesn't come with an AC adapter, so that was an extra, as were 75MB of memory cards (one 15MB and two 30MB). Nikon provide three levels of JPEG compression, the smallest file size being about 150KB, or six pictures per megabyte. I reckoned that the 75MB I bought plus the 4MB that came with the camera would allow 480 pictures, about 24 per day over a 20 day holiday. Experimenting in Edinburgh showed that the quality achieved even at the highest compression setting was really very good, you have to look hard to see the JPEG artefacts, and the resolution stays at 1280 x 960. A CompactFlash card is tiny compared with a floppy! One other requirement I had was that the camera must have a zoom lens, as my old 35mm kit included a 35-135mm zoom lens. The CoolPix 900 has a 35-105mm equivalent zoom, so it is almost enough. I did have to compromise at the wide angle lens end - at first I couldn't get an equivalent to the 24mm wide angle I used to carry. Front view of camera showing handgrip (left) and rotated lens and flash (right). The covering hatch for some of the connectors can be seen in the central section. Later on I was able to get a couple of converters for the 900 - a 2X teleconvertor making the maximum focal length about 230mm equivalent, and a X0.7 providing about 24mm equivalent. I could also use a digital interpolation to double the focal length although without really increasing the image resolution. One output from the camera is a standard TV feed, to the 625 line PAL standard (as I bought the camera in Scotland). This proved to be very useful in Sweden as we could replay the pictures when we got back to the hotel at the end of the day, and delete bad pictures. The only extra needed was an RCA phono to SCART adapter. OK, but there's no way of rotating portrait orientation pictures into the landscape format of the TV, so your neck suffers a little! 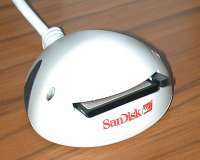 SanDisk's ImageMate parallel port adapter to use CompactFlash cards with a desktop PC. Although the Nikon CoolPix 900 provides a serial cable and PC software for Windows 95, we chose to get a SanDisk ImageMate adapter. This runs under Windows 95, 98, 2000 & NT, and simply makes the CompactFlash memory card look like another disk drive on the PC. So you can then simply drag and drop files from the memory card to your hard disk. Be sure to clear some disk space ready for all those pictures! By the way, if you a have a portable PC you might find that the adapter comes with the memory card ready to plug into a PC Card slot. For my originals, I keep all files as if they were negatives from a particular film, treating each reuse of a 20MB card, say, as a new film. So I have folders called 20MB-1, 20MB-2 and so on. These are originals with the same names as the camera gave them. I can then copy these files to CD-R for long-term backup.